Don’t let the effects of salt ruin your car. WASH ME! While the use of road salt increases driver safety, if left unattended, it will damage your car over time. Salt is corrosive to the underbodies of vehicles and is known to shorten the life of and compromise the integrity of vehicle’s bodies, frames, and systems. At times there are no ways to avoid salty roads, but there are steps you can take to mitigate loss. Most professional car washes are fitted with equipment designed to clean the underbody of your vehicle safely. At Kwik Car Wash, the Protection Wash both cleans AND protects it. First, a piping hot, high-pressure spray scours the underbody. Then a rust inhibiting agent is applied, creating a sacrificial barrier aimed to prevent underbody corrosion. Also included in the Protection Wash is A Teflon sealer. It covers the entire body of the vehicle, adding another layer of protection and shine. Kwik’s Protection Wash costs $14 for a one-time wash or $24.95/month for unlimited washes. 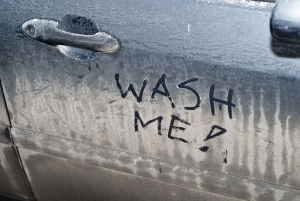 Vehicles should be washed after each snow storm. This process has been in place for years at Kwik, and the customers that adhere to it continue to come back with the cleanest, shiniest, most well-protected vehicles around. For similar results, look no further.